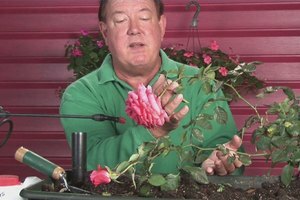 Rooting roses means growing them from their own root stalk by placing them in a good, organic soil. 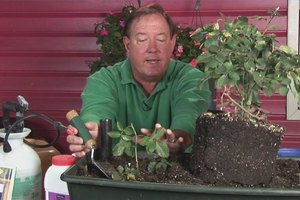 Plant roses down about an inch into the soil with help from an urban horticulturist and gardening adviser in this free video on growing roses. I'm Stan DeFreitas, Mr. Green Thumb. 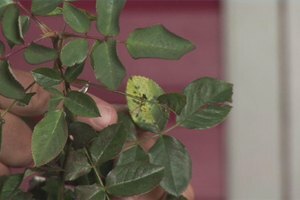 Okay, you want to grow your own roses. Well, you can grow them on their own root stalk. 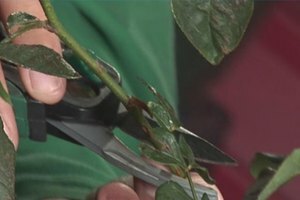 You simply come in, take a cutting; cut this piece maybe about four to six inches; probably cut off most of your foliage. And when you set it into the soil, make sure it's a good PD organic soil and plant it down about, oh, maybe an inch or so into the soil. I sometimes use a little bit of rooting hormone and keep it moist. Remember if the cutting dries out, it dies out. So you've got to keep this cutting good and moist. Sometimes I'll put like a little plastic bag over it that you get the newspaper in; or make like a little mini green house. 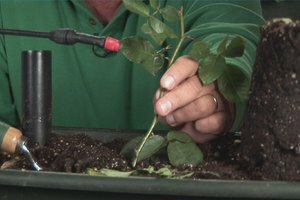 If you increase that humidity, you make it easier on the plant so it's not transpiring too much water out of the foliage until it sets up roots. 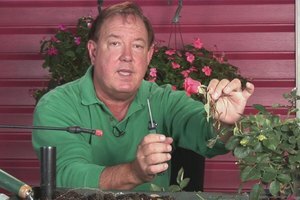 Miniature roses are easy to propagate. 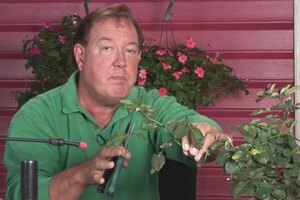 Many of the climbers are easy to propagate; most of your hybrid teas, you're probably going to graft. But if you take your little cutting, use a little bit of rooting hormone like indole butyric acid; put it on there just a little bit. Remember not like shaking bag, just a small amount; keep it moist; it should root out in about four or five weeks. For ask, mrgreenthumb.com; I'm Stan DeFreitas. How Well Does Roebic Root Killer Work? Can You Plant Roses in July?